After Sporting's dream start to the season with yet another wonderful result and performance and Benfica's hard-fought win against Gil Vicente a few minutes earlier, it was up to FC Porto to show just what they were capable of. To maintain their three-point lead ahead of Benfica, the Dragons had to win Paulo Fonseca's first match in his new stadium, in order to keep the momentum going. Unlike the expectations of this reporter, the matched turned out to be an absolutely one-sided event, with Marítimo never looking like they were capable of threatening the home team, despite the sheer speed from the three forwards - Sami, Derley and Artur. Their pace, which had proved so devastating against Benfica, was never on display at the Dragão. This is why, instead of chronicling the incidents of the match, we will be taking a somewhat closer look at the differences and similarities between Paulo Fonseca's team and his predecessor Vítor Pereira's. This perhaps complex-sounding phrase just refers to the moment when a team are attacking when the other team are arranged in their intended defensive shape, the phase of play where FC Porto spend most of their time. There are plenty of similarities in this category, namely with Otamendi taking charge of the first build-up stage. However, not only has his involvement been enhanced, but there is also much more cooperation from all midfielders. But we'll get to that later on. On the wings, things have also changed a bit. Even though there hasn't been a significant change in personnel (Danilo and Alex Sandro remain the full-backs and Varela should reclaim his position as soon as he's fit), the inclusion of Licá has given a different array of solutions to the team. In the initial build-up phase, Licá tends to drift inward, opening up space for Alex Sandro, but, as the play evolves, he often gets wider, proving hard to mark - he can try to get to the goal line or drift inside to use his right foot (you can watch his assist from last night here and his goal here). With Vítor Pereira, the task of starting out attacks usually befell upon João Moutinho, who would drop back alongside Fernando and work his magic from there. With Paulo Fonseca, Lucho González's initial positioning is significantly higher up the field, but he often drops back at the same time Defour advances, causing defensive uncertainties. Furthermore, Josué, starting out from the right, plays much narrower than a usual winger tends to do, forming a square in midfield - Fernando alongside Defour in a first line, Josué alongside Lucho González higher up. This organisation often resembles the shape Fonseca imposed on his previous team, Paços de Ferreira. Also, the chance-creation setup seems rather different from last season. Even though the pressing (more on that later) and ball circulation remain similar (at least as far as the results they produce), there now seems to be a more objective intention to instill the team with greater urgency upon attacks, rather than biding their time for an opportunity to come up. The dynamics with which that takes place is quite interesting, since it seems mandatory that there is always someone playing in the hole (i.e. on the edge of the penalty box or in the vicinity) at all times - either for an assist or for a shot. Nevertheless, the wings are now much more of an option than last year, either with crosses or penetrations. This is the few seconds when the team with the ball gives it away for some reason - and how they react to it, before they manage to get into the shape intended by their manager for the defensive phase. Different coaches ask different things from their charges, from pressing immediately to dropping back straight away and forming two banks of four, for instance. Paulo Fonseca has picked off where his predecessor left off and, if anything, has upped the tempo and intensity with which the team try to get the ball back the second they lose it. Perhaps knowing that a staggering amount of opportunities created stem from balls won back in the opponents' midfield, FC Porto coach has imposed the imperativeness to get the ball back as soon as possible. While it didn't work as well against Setúbal the week before, matches against Guimarães and Marítimo lead us to believe that that is the master plan. Because FC Porto have dominated most of their latest opponents, it's still hard to extricate all the differences. However, this is the game phase where the Dragons seem least comfortable. 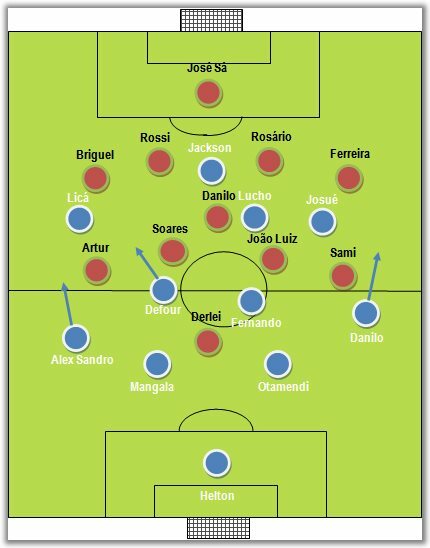 Whenever the attempt to win the ball back in the immediate seconds after giving it away fails, Fonseca's men often look poorly positioned and in numerical inferiority (not unlike Jorge Jesus' Benfica, at times). While this may not be a problem against domestic competition, stay tuned for possible problems FC Porto may encounter when facing tougher opposition - the Champions League immediately springs to mind. This is perhaps one of the areas in which FC Porto have changed the most. Much more direct and voracious, the team immediately try to look for their opponents' weak spot and proceeds to exploiting it whenever possible. Last night, Licá's goal constitued a perfect example of the Portuguese champions can also be effective on the counter-attack, especially now that they can count on a goal-scoring winger to finish off moves. If one looks at the whole play, one will be able to see how quickly FC Porto pounced on Marítimo's blind side (the side where the ball is not), causing an imbalance in Marítimo's defence (credits must go to Ricardo Pereira for noticing this during the match). All in all, it seems a tremendously dynamic system of play, one which may not be certain to yield the same results when the going starts to get tough(er). However it turns out, it should be quite interesting to watch how it all pans out.